to discuss the possibility to become a player in our team of champions! Interviews with candidates on a confidential basis. Responsible, adult attitude toward life, a staunch character. Commitment, a desire to grow and achieve results, a healthy drive. Team spirit and mutual support in the team. Desire to earn for oneself and for the company. Endurance and ability to work under stress and time pressure. Deep knowledge in chemical sciences. Сomputer literate, experienced in Excel, Word, Power Point, Outlook Express. Competence in work with Internet search engines. Business trips within Ukraine, visits to clients and office work. To expand the number of customers. 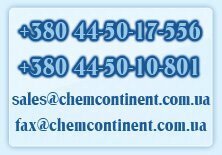 To increase the portfolio of chemical products and the sales volumes. Orderly preparation of documents for business transactions. To autonomously run your own business segment. Flexible scheduling! High labor motivation! Autonomous work and freedom in achieving success! For more information on the job offer, please follow the link "Contact Us" or use the online form at "Feedback".